The local professional volleyball team "Pioneer Red Wings" takes part in the professional league in Japan "V league" now. This time they played with the "Ito-Yoka-Do" in Kagoshima Pref. next to previous day. And they was defeated by 3 to 1. Their total grade was 2 won and 4 lost. When we compare an average height of "Pioneer" with "Ito-Yoka-Do", "Pioneer" is less than 5cm. But, a movement attack of Reiko SUZUKI and back attack of Mayumi SAITH and Miki NISHIHATA broke the blocking of other team. Next time they have a game with "Denso AIRYBEES" in Naze city, Kagoshima Pref on January 8, 2001. The local professional volleyball team "Pioneer Red Wings" takes part in the professional league in Japan "V league" now. This time they played with the "Seaguls" in Kagoshima Pref. And they was defeated straight. Their total grade was 1 won and 3 lost. "Pioneer" pushed forward a match in superiority, 1st set was 24 vs 22, 2nd set was 21-19. But they had mistakes of a service and a spiking, they were caught up with others. Next time they have a game with Ito-Yoka-Do in Sendai city, Kagoshima Pref on January 7, 2001. 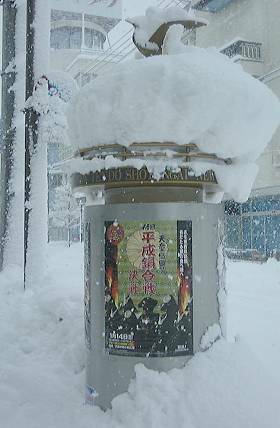 It snowed continually from January 1 in Yamagata Pref. So much snow stopped the bullet express Yamagata Shinkansen. It is the first time to stop completele the Yamagata Shinkansen after the running it in 1992. Much snow fell down trees around the track, did not switch a point, etc. 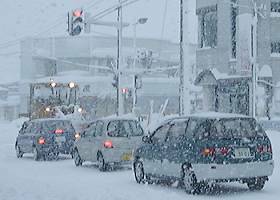 In Tendo, we had much snow which was covered the tire of cars. So we had to remove snow from early morning. Tendo is a area which has the least snow in Yamagata Pref. I think that it was much snow after ten or twenty years. Snow piled up continuously just after I removed. We have much much snow that we had never have an experience in a few years. That much snow damaged the vineyard at Midaregawa area in the north area of Tendo. January 4 (Thu.) Despaired 2 flights per a day bound for Tokyo? Yamagata local goverment announced the use results of the flight between Yamagata and Tokyo in 2000 which the company ANA(All Nippon Airways) operates. They also announced that the use rate on December, 2000 was below. They announced that the totally use rate was 61.1%, or 65.1% even if they convert it by the A320 which they went operation most a lot. The company ANA said that they will consider to increase the flight if the use rate will be over 70%. Therefore I think that the flight between Yamagata and Tokyo will continue only one flight per a day.